There's so many people on the fixed bandwagon these days that it's probably looking a bit like a slow train on the Indian subcontinent by now. That's no bad thing if it means that we get better bikes, and economies of scale mean that they drop in price. The Marin Dominican certainly fits the bill on the first point: it's a very capable and well put together bike that's a fun ride straight out of the box. And the second? well, it's not a steal at £525 but it is decent value for the build quality and the kit you're getting, so we're not really complaining. The Dominican's frame is a 4130 Cromoly offering that's well put together with tidy welds and subtly shaped tubes, it's matched to a gently curved steel fork. Geometry is not too aggressive, with our large size running a 570mm effective top tube and shortish head tube that's tempered a bit by the riser bars, giving a good position for town riding. The bike is nicely specced both in terms of the quality of the kit and the aesthetics. Tektro dual pivot callipers front and rear are operated by 'cross levers, and the rear cable is attached with stainless cable clips so you can remove it if you want to flip the unbranded high flange flip-flop hub at the rear. 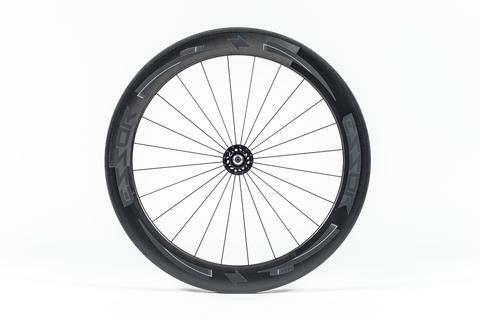 There's a matching front hub and they're laced with black spokes to green Alex semi-deep rims that have a machined braking surface. You get good quality Vittoria Zaffiro folding tyres too. A Sturmey Archer chainset with a 44T ring drives a 17T freewheel or fixed sprocket, depending on your preference, giving a 69in gear that'll probably spin out a bit too easily if you live somewhere flat but is welcome in the hilly South West. The narrow risers are the minimum width current new bike legislation will allow – I found them just about right but I have fairly broad shoulders – and the saddle is a Regal-alike that's comfy enough. The first thing I had to do was swap out the seatpost: being fairly long in the leg I tend to run a lot of 'post and the 250mm one supplied wasn't long enough, in spite of the fact that otherwise the bike fitted me very well. The next thing I did was stop at a friendly Kwik-Fit to borrow an adjustable spanner so I could tighten up the rear track nuts! My fault for not checking before I set off. Out on the 'mean' streets of Bath the Dominican was a joy, the sub-1m wheelbase and low weight making it feel responsive and very chuckable in traffic. The frame gives a good ride, there's pleny of stiffness for when you're stamping away from the lights but it feels springy like a steel frame should. It's not overbuilt and the thin stays and 28mm tyres soak up plenty of chatter from badly surfaced roads. When you're at an event like an alleycat riding a brand new bike you feel a bit of a johnny-come-lately; there's a long tradition of building fixed bikes from the parts bin and there were plenty of well-loved machines there. That's not for everyone though, and there's definitely a place for an off-the-peg fixed, you've only got to look at Charge's success with the Plug and Felt's with the Brougham to see that. Bikes like those two are the most obvious competitors and in terms of bangs per buck you're getting a similar package for a similar price here. From an aesthetic point of view there's lots to like about the Marin: it doesn't look like it's trying too hard and the subtle branding – more about 'Dominican' than 'Marin' is easy on the eye. Add to that the fact that it's a fun, responsive ride and it's a definite competitor in this market. 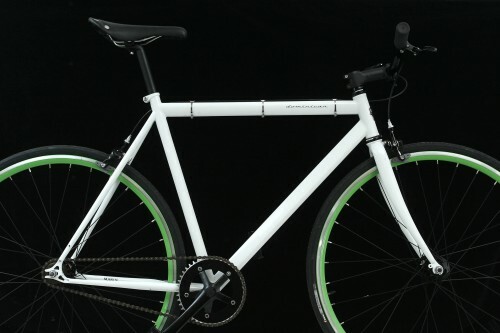 The Urban Singles range are a dedicated fixed gear/flip flop bike, in cities currently dominated by the automobile. Would you rather have the freedom of a low maintenance machine? Brakes or no brakes: you decide, this has to be cycling in its purest form. Now spawned from the courier riders’ need for an uncomplicated workhorse, to be used daily without the need for new cables, brake pads or expensive drive train parts. Flowing in and out of the urban sprawl has become an art form, from the clothes that they wear, to the skill needed to pilot a fixie on the intimidating city streets. You too could become a part of this subculture. Did the bike feel stiff in the right places? Did any part of the bike feel too stiff or too felxible? Would you recommend the bike to a friend? Yes, if they were a smart city girl. Can you stop reviewing "fixies" please? I can't be the only person that is thoroughly bored of seeing these reviews. What is there to say about a bike with no gears, only designed for posing around town on? heh - the anti-fixed hating has begun. in fairness, there are plenty of geared reviews, and if you are bored of reading fixed gear reviews, you might like to consider stopping reading them. I'm all for more people riding bikes and if people trying to be trendy promotes riding - great. There's just pretty much sod all you can say about the actual bikes themselves and I can't help thinking there are more interesting bikes out there to review. Like bikes that are actually used for races, trails, tours - you know exciting stuff. Just because a bike only has one gear doesn't mean there's any less to say about it, for a start what sort of terrain and riding is the one gear it has going to suit? On a geared bike we're going to talk about the range of gears and the slickness, or otherwise, of changing them which isn't that much more info. Lack of gears throws more attention on the other equipment choices and crucially how the bike handles - a big issue on a bike that's likely to be nipping in and out of urban traffic, it's also somewhere where you can see the bikes evolving a bit as some manufacturers move away from pure track geometry and introduce more road bike elements. Don't worry though greennoodle, we've got plenty reviews of other types of bike coming up in the next few weeks, including race bikes from Felt, Kinesis and Sabbath + tourers from Revolution and Kona, we've got a couple of singlespeeds too, the Cannondale Capo and the Trek District Carbon - neither of which could be described as boring. I always thought the key components of a bike were the frame and wheels, so not sure how a lack of gears means nothing to review. I don't ride fixed, but do like my single-speed for town riding - it's lack of gears makes it reliable and low on maintenance. if you'd seen it, you certainly wouldnt say it was for posing... Please keep reviewing all sorts of different bikes - variety is interesting! Sorry maybe I was being overly grumpy. I think it was just this review hot on the heels of the Mongoose one that did it. RoadCC is not always a roadie mag, sometimes fixie, sometimes gears and tourers-why not? Makes a change from reading roadbike after roadbike review. Quite liked the cheaper Mongoose too but I like the options to have a freewheel on these bikes. Just don't start reviewing mtbs please! Yep, road.cc is about road riding in it's broadest sense - we're interested in every aspect of riding on the road from commuting to competing and all points in between, and we're certainly interested in all sorts of bikes (be writing about my new one soon) -we definitely need to do some more touring bikes and we need to review a tandem or two as well I reckon. Don't worry we won't be reviewing MTBs any time soon Zaskar, not cos we don't like 'em - Dave's been out riding one today, but simply because they are well covered elsewhere, Singletrack for instance. No excitement on a fixie? try a steep hill on a low fixed gear, around a 58" without touching the brakes, 160, 170 rpm is plenty exciting. Just to clarify, that'll be going down, rather than up, yeah? If not, you really should be in Lycra and in France right now.